Ever Traveled with Modern Coast Express Limited, a luxurious bus company in Kenya.? If not, here is the moment for you to enjoy the luxurious moment with Modern. Modern Coast gives you discounted travel tickets to destinations of your choice. 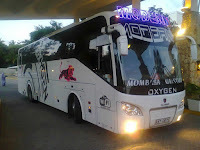 Modern Coast also offers back bench discounted princes on every Mondays, Wednesdays and Saturday with their Oxygen Bus.